Klaus Schauser is Founder and Chief Strategist for AppFolio. In 2006, Klaus, along with Jon Walker, founded AppFolio with the mission to revolutionize the way small and medium-sized businesses grow and compete by enabling their digital transformation. Today Klaus brings his enthusiasm, leadership and experience to the team as he validates vertical market offerings and sets the strategy for the future. Prior to AppFolio, Klaus co-founded Citrix Online, (merged with LogMeIn, Inc.) providers of secure, easy-to-use cloud-based solutions that enable people to work from anywhere with anyone. From 1999 through 2006, Klaus served as Chief Technology Officer and was the visionary behind GoToMyPC, GoToAssist, and GoToMeeting. He led the teams responsible for building the products and their secure, reliable SaaS infrastructure. 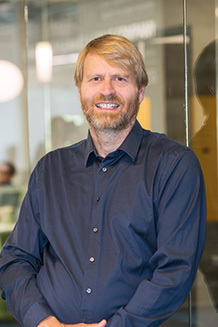 As a Professor of Computer Science at the University of California, Santa Barbara, Klaus is a widely-published research scientist with extensive experience developing scalable, highly parallel computing environments. Klaus holds a Ph.D. from the University of California, Berkeley and has received numerous academic awards. When he's not sharing his vision, you can find him outdoors hiking or stand-up paddleboarding.